This past Saturday I visited the Heart Shrine Relic Tour with my mother and husband in nearby New Orleans, LA. The tour is a unique collection of more than 1000 sacred Buddhist relics. Most of the relics resemble pearl-like crystals, and they were found among the cremation ashes of Buddhist masters. Some of these relics are from the historical Buddha and his closest disciples, as well as many other well-known Buddhist masters from different Buddhist traditions. Buddhists believe these relics are produced as a result of the master's spiritual qualities of compassion and wisdom. Therefore, the tour is bringing these relics around the world with the message of love and kindness to people everywhere and from all spiritual traditions. Before entering the temple, we watched a short video about the relics and the world-wide tour. The purpose of the tour is not only to share the message of love and kindness, but also to raise money for the Maitreya Buddha statue that is being built in India. It is inside this 500 ft. statue that the relics will find their permanent home. 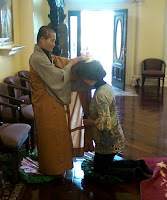 I took off my shoes before entering the temple, at which time I witnessed a beautiful display of the Buddha and the sacred relics. The relics were on a series of tables that surrounded a large, golden Buddha. The Buddha was also surrounded by a picture of the Dalai Lahma and other Buddhist masters. Behind this display was a beautiful altar with an even larger gold Buddha statue and towers of fruit. The relics did indeed resemble small pearls, and each relic had the Buddhist master's name, year of death, and either a picture or drawing of the master. As more masters passed, less pearl-like relics were found among the ashes. The masters of thousands of years ago seemed to produce more relics for some reason. A female Buddhist monk was available for blessings afterwards. The monk was very plain, with a shaved head and brown robe. The blessing involved kneeling before her on a pillow and having a silver vase with relics inside placed on top of my head. The monk never spoke, but held the vase in place for about a minute, then raised it and nodded. I could feel a warmth radiate from the vase and enjoyed the calm and peaceful surroundings of the temple. On the way out, we drank a cup of blessed water for good karma and health. My mom and myself getting blessed. The Buddhists believe that no matter what your religion, we can all come together with compassion and kindness. If this tour comes to your area, I recommend that you see it. We can all use a little reminder of peace and compassion in our lives!